Institutional investors will soon be able to sell shares without owning them, stock market regulator Securities and Exchange Board of India, (Sebi) said, adding, “very soon" rules for short-selling will be announced. On 22 March, the market watchdog had approved a plan to allow short-selling by both domestic and foreign institutional investors. 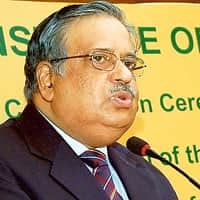 Saying there were just a few formalities left, board chairman M. Damodaran told PTI in an interview, “We are ready for it (short-selling) now... there is no hiccup and the regulations are coming very soon. Both domestic and foreign investors have demanded its introduction," the Sebi chief said. One of the trading facilities available in other global markets, short-selling, is likely to benefit the market in more ways than one, analysts say. Apart from improving efficiency and liquidity, it will also help increase participation in a falling market since institutions will try to take advantage of such a market by going short, thus improving the market depth. “I do not see any problems due to short-selling. Ours is a very mature market...in fact, we need more products for further growth of the Indian capital market and short-selling is one of those products that would aide to the growth," Damodaran added. Talking about widening the capital market, he said, “We can achieve further growth by ensuring more investors and more products in the market." In the F&O market, the Sebi chairman said futures segment was growing, but options segment had not grown much, adding, “As we go forward, we will look at launching new products in the F&O segment." Damodaran also said hedge funds are welcome to invest in India, provided they comply with the existing regulations for foreign institutional investors (FIIs). “Why should we be worried about hedge funds...we are not making any separate set of regulations for them...they have been investing in India through participatory notes. All we are telling them is if you want to come here, come through the front door," he said. “Hedge funds started as a normal class of investors. Over time, they became large with large investors putting their money in these funds," Damodaran said. Hedge funds are speculative funds managing funds for private investors. They collect a portion of the profit, beside a management fee. “Indian economy is on a roll and the stock market is growing and any savvy investor would want to invest where good returns are available," the Sebi chief said on the strong demand shown by hedge funds in Indian equities. Mostly prevalent in developed markets such as the US, these funds are generally used by wealthy individuals and institutions to adopt aggressive investment strategies and are exempt from rules and regulations governing other mutual funds provided the number of investors is not more than 100. “In FII regulations Act of 2004, hedge funds were not named as a separate class and no specific provisions were made for them...There were no separate regulations for them anywhere in the world," he said, replying to a query on whether hedge funds should be considered a different class. Asserting that Sebi is not making separate regulations for registration of hedge funds, Damodaran said, “We are not even looking at whether they are a hedge fund or not."